The charming mee-shay at 16th Street allures people from different strata to sit down at this modest stall, just to enjoy a bowl of rice noodles with pork innards for $1. Though appears to be simple, the rice noodles here pack a bold taste to tantalise the palate of the exotic demanding gourmets. 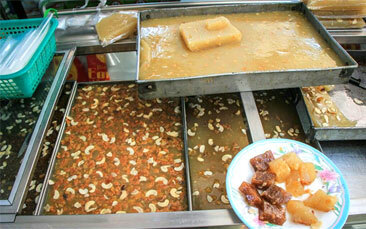 Nearly everybody who visits Mandalay buys some-htoe mote and la-mote—sweet cakes made from rice—to take home. Neither is originally from Mandalay—htoe-mote came from Thailand while la-mote came from China—but have been in the city since the era of the Myanmar kings. Today, there are many varieties of htoe-mote, including ones with coconut cream, strawberry and other fruits, thanks to the efforts of the city’s htoe-mote makers. La-mote came from the Chinese moon-cake but has developed its own taste and style over the past 100 years. 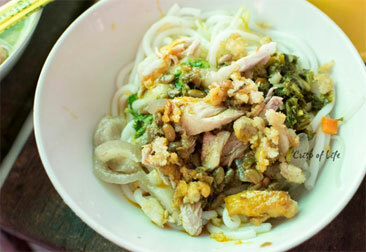 Being a popular breakfast dish in Mandalay as well as in the country for many years, the dish features white-coloured noodles made from rice, mixed with meat curry, onion oil, fried fish cakes and a few other ingredients. However, the most important ingredient is roasted bean powder—the best bean powder means the best nan-gyi-thoke. 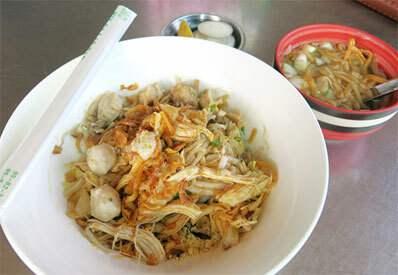 At the mont-di shop, one can order nann-lat (medium-sized rice noodles) or nann-gyi (large-sized rice noodles) salad as well as san-pyar (flat rice noodles) and common noodles. Ingredients that go in mont-di are fried beef curry, chicken and its intestine, tender bone and gizzard. Or, you can order these ingredients separately. 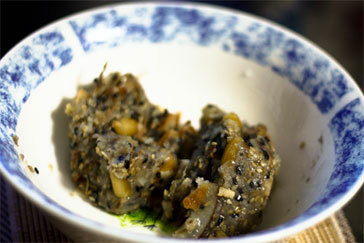 You can also add fried onions and pea flour to adjust your taste. Mont-di goes perfectly well with pickled bean sprouts and hot fish-ball soup. As the Myanmar saying goes ‘food is medicine and medicine is food’, clean, fresh and tasty food is vital for one’s health. Having a close proximity to the Shan region, the food in Mandalay is largely inspired by the Shan. The influx of tourists to Mandalay also helped the blooming of gastronomy offerings in Mandalay, but what Mandalay has done remarkably is keep its traditions while also adopting other tasty foods. Below are a few local yet authentic Burmese dishes that you should try during your visit. In the past, many traders who visited Mandalay often brought their own traditional foods to the city. One of these was mee-shay, which has been modified slightly to make Mandalay mee-shay. This dish is made by taking a small amount of rice noodles and boiling for a while to soften them, and then mixing in a bowl with pickled vegetable, fried flour balls, boiled pork, chilli paste and bean sprouts.